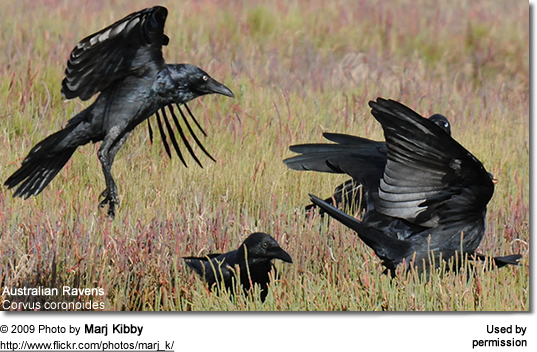 The Australian Raven (Corvus coronoides) is the largest member of the genus Corvus in Australia. 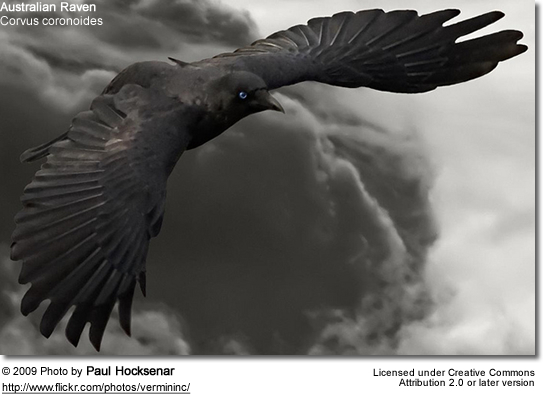 It is a more slender bird than the Common Raven of the Northern Hemisphere but is otherwise similar. 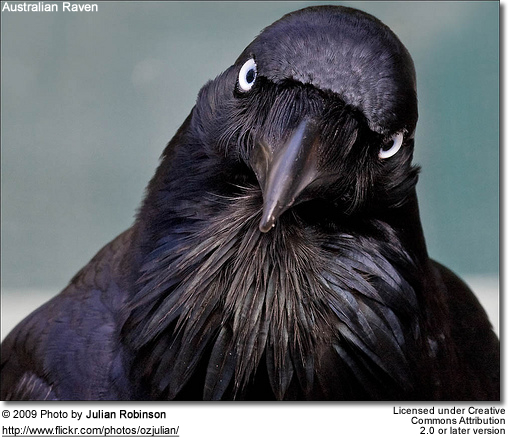 At 52 cm (20 in) in length, the adult Australian Raven is an all black bird with black feet and beak and a white iris. The plumage is glossy with a blue-purple to blue-green sheen, greenish over the ear coverts, depending on light. The underparts are not glossy. Its throat feathers (hackles) are longer than those of other species. 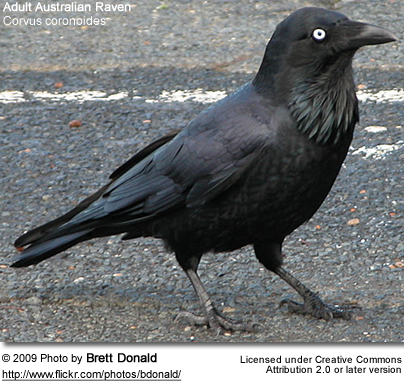 It can be distinguished from the two species of crow occurring in Australia by the grey base of the feathers, which is white in the latter species. Juveniles resemble adults, but have dark eyes, shorter throat hackles, and sometimes have a pink fleshy. 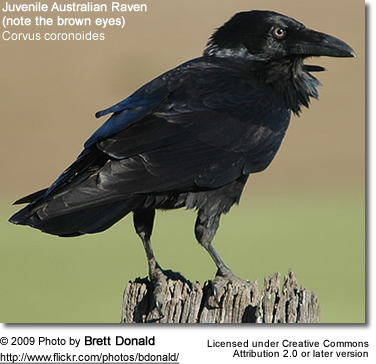 The Australian Raven is common throughout eastern, southern Australia and southern Western Australia (the populations being connected by a narrow strip across the Nullarbor Plain) but not found in the far north. 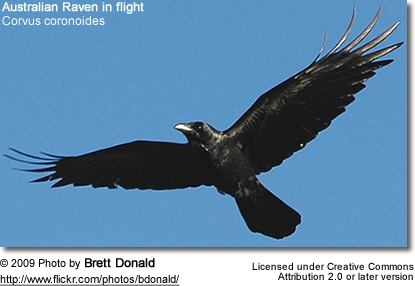 It has adapted very well to human habitation in some cities and is a common bird in urban Sydney, and Rottnest Island. In rural areas a single breeding pair and their brood will occupy about a square kilometre territory, whilst in urban areas over ten times as many ravens can search for food in the same square kilometre. Food consists of carrion, insects, seeds, fruit, small reptiles, nestlings and eggs. The preference ratio is 34% carrion, 42% s (= animals without internal skeleton, such as insects, earthworms, millipedes, snails, spiders) and 24% plant material. Food is taken mainly from the ground but will occasionally feed in trees. Ravens have adapted well to eating rubbish and scraps in urban areas, such as school playgrounds. In one isolated study they were observed feeding on nectar from eucalypt flowers. Breeding season is from July to September. Ravens always nest in tall trees, never near to the ground as some species do. Nests are generally large and untidy, consisting of a bowl or platform of sticks lined with grasses, barks, and feathers. A clutch can comprise 3-6 eggs, though usually 4 or 5 are laid. Measuring 45x30 mm (1¾x1¼ in), eggs are pale green or bluish-green splotched with darker olive, brown and blackish markings. Incubation of the eggs is done solely by the female over roughly 20 days. Only one brood is raised per year. Fledged by 45 days and staying with parents for about four months after that. The territorial call of the Australian Raven is a slow, high ah-ah-ah-aaaah with the last note drawn out. 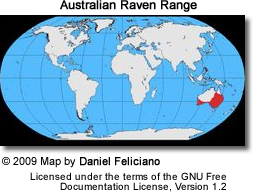 It will use this call to communicate with other Australian Ravens in the area.